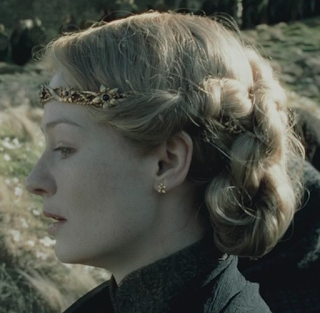 While we mostly see Eowyn with her flaxen tresses floating on the breeze, she did have her hair pulled back for Théodred’s funeral into a pretty braid bun. This is my second favorite hairstyle, because of its elegance. 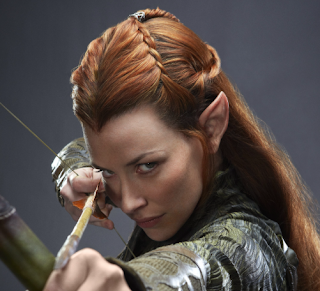 I’d never be able to leave my hair hanging loose if it were that long, but somehow Tauriel manages to be the captain of the Elven guard and have long, beautiful hair. I love how the top half is pulled back in braids, while the rest of her flaming hair falls past her waist. If you could style your hair anyway you wanted to—regardless of skill level ;)—how would you style it? 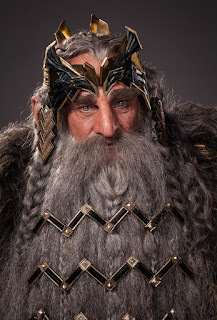 What are some of your favorite fantasy hairdos? Are there any fantasy hair don’ts that you’d like to share? Thank you! Oh, it sounds like there are a lot of fun ways to style your girls' hair. I think so too ;) Thank you for the comment! This is an awesome post, Liz! This is not a fantasy book or movie, but I love Meg Ryan's hair styles in Sleepless in Seattle. They would look really cool in a fantasy story too. Erin, I bet your daughters' hair is so fun to do for the Renaissance Festival! I guess this isn't exactly fantasy, but I love Leia's hairstyle when they are on Bespin in The Empire Strikes Back. The top half of her hair is in a bun, and the bottom half is in two braids formed into loops. Thanks for the comment, Brenna! Fun idea, Liz! I tend to like Regency-type hairstyles, many of which I think would fit well in a fantasy world. Tauriel's braids are so pretty, and I love that you included a beard :) I generally stick with curly updos when I want my hair to look fancy since I don't even need to curl it!